Normally, any upcoming release related to Cthulhu would get a significant portion of the Daily Illuminator spotlight. But between the holidays, the two nifty dice games (Zombie Dice and Cthulhu Dice), and the unboxing videos -- not to mention the general weirdness we report on to serve the mysterious purposes of the Secret Masters -- poor little Chez Cthulhu has been feeling a little ignored. Let's remedy that situation, shall we? To the left, of course, are the components you'll have once the box is opened -- the cards and rules are familiar, and the utility of the tokens are immediately obvious. As you'd expect from a Chez game, there are many familiar elements. Roommates? Check. Jobs you wouldn't wish on your worst enemy? Right there. Slack? You betcha. But Madness? Tentacles? Evil Ritual Nookie? These are the sorts of things that set Chez Cthulhu apart. 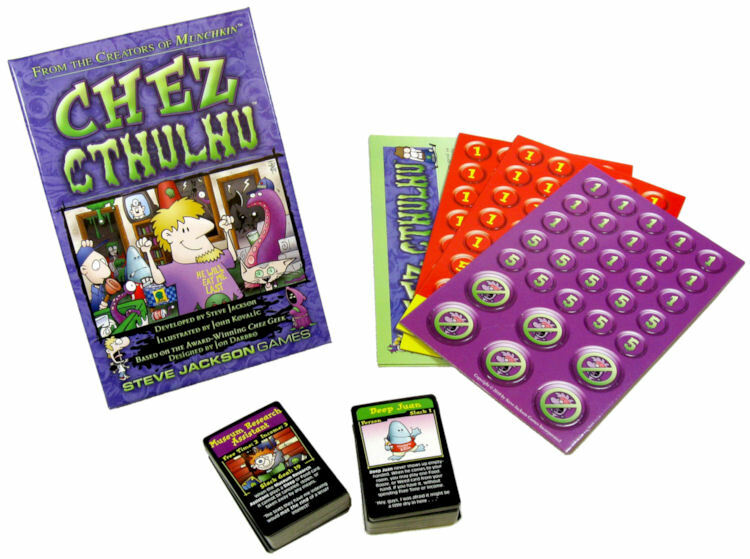 Chez Cthulhu ships in February.